Meet the "Mega Earth." Described today by astronomers from the Harvard-Smithsonian Center for Astrophysics, this ancient rocky world weighs 17 times as much as Earth — which is a big surprise considering that rocky, solid planets aren't supposed to get that huge. It's called Kepler-10c and it's located about 560 light-years from Earth. It circles a sun-like star, Kepler-10, once every 45 days, so it's in a fairly tight orbit. 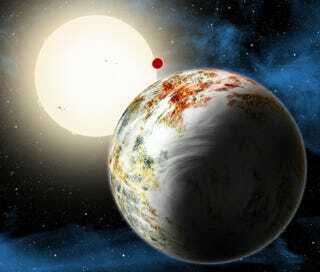 The system also hosts a 3-Earth-mass "lava world," Kepler-10b, in a crazy-fast 20-hour orbit. Astronomers have known about Kepler-10c for several years. Preliminary measurements indicated a diameter of about 18,000 miles (29,000 km), which is 2.3 times as large as Earth. Based on these particulars, astronomers concluded that Kepler-10c was a mini-Neptune — planets featuring thick, gaseous atmospheres. But new measurements taken by the HARPS-North instrument on the the Telescopio Nazionale Galileo (TNG) in the Canary Islands unexpectedly revealed that the planet weighs 17 times as much as Earth. This means that Kepler-10c must have a dense composition of rocks and other solids. It also features a significant amount of trapped water — about 5% to 20% by weight. It's considered the first firm example of an entirely new class of solid planets with masses above 10x that of Earth. With its significant mass, the planet exhibits a surface gravity of about 30 m/s², which compares to Earth's 9.78 m/s². That's over three times as much. As an aside, astronomers have discovered massive gas giants about 13 times the mass of Jupiter. "We were very surprised when we realized what we had found," noted astronomer lead astronomer Xavier Dumusque of the Harvard-Smithsonian Center for Astrophysics (CfA) in a statement. Prior to this discovery, astronomers didn't believe a planet like this could form. According to theory, an object this heavy should have drawn in hydrogen gas as it grew into a Jupiter-like gas planet. Kepler-10c didn't lose its atmosphere over time. And in fact, because it's massive enough to have held onto one, it likely never formed one in the first place. But this planet is for real, hence the new "mega-Earth" classification, and a required rethink of current planet formation theories. According to CfA astronomer Lars A. Buchhave, there may be a correlation between the orbital period of a planet and the size at which a planet transitions from rocky to gaseous. If he's right, it's likely that more mega-Earths will be found as astronomers identify planets further-out from their host stars. "This is the Godzilla of Earths!" said CfA researcher Dimitar Sasselov. "But unlike the movie monster, Kepler-10c has positive implications for life." Indeed, the Kepler-10 system is absolutely ancient — about 11 billion years old, which means it formed less than 3 billion years after the Big Bang. But back then, the early universe was deficient in silicon and iron. These heavy elements are needed to make rocky planets. This suggests that the universe was able to form huge rocks even during the time when heavy elements were scarce. "Finding Kepler-10c tells us that rocky planets could form much earlier than we thought. And if you can make rocks, you can make life," added Sasselov. This is important because it means that old stars can not only host Earth-like terrestrial planets, they could also be potentially habitable. But don't get your hopes up about Kepler-10c. It features a temperature of 485°K (211°C/413°F) — almost four times as hot as Jupiter. These findings were presented today in a press conference at a meeting of the American Astronomical Society (AAS) : "The Kepler-10 planetary system revisited by HARPS-N: A hot rocky world and a solid Neptune-mass planet."